The Northfield™ cast iron gas stove is a true work of art. Its classical Early American design and three-sided wrap around fire view more closely resemble a piece of fine furniture than a gas stove. Despite its size, the Northfield features an incredibly large 416 square inches of fire viewing, which highlights the stove’s beautiful fire display from any angle in the room. The ceramic glass on this stove features the 2015 ANSI approved invisible safety screen to prevent accidental contact with hot surfaces without detracting from the stunning fire view. The Northfield produces up to 22,000 BTUs and has an exceptional turndown ratio of 70%, giving you the ultimate control over the heat output level. This stove can be top or rear vented and boasts close clearances to adjoining walls (5” in the back and 3 ½” on the sides), allowing you to install it virtually anywhere in your home. 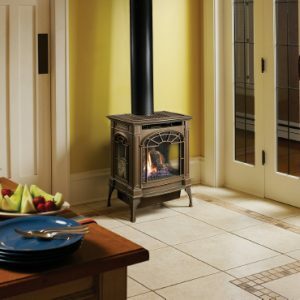 The Northfield features the revolutionary GreenSmart™ 2 gas system and the award winning Ember-Fyre™ burner. The incredibly realistic Ember-Fyre™ burner simulates a real wood burning fire with its highly detailed log set and glowing, yellow flames. The optional GreenSmart™ 2 Wall Mounted Remote allows you to control every function of this stove from the comfort of your favorite chair. Burn Rate Range: Up to 26,000 BTUs/hr.